“This is the perfect combination of small school and big place,” said one of our tour guides. The school offers all the benefits of an 1800 student undergrad community on a small campus combined with the resources of the Colleges of the Fenway Consortium (students have access to 2,300 classes!) and Boston. As students they have access to a lot of reduced price attractions; the tour guides were particularly excited about the $7 cinema tickets (with reclining chairs) and $10 aquarium tickets. Although this is single-gender (the only women’s college right in Boston), “Wentworth is literally across the street, and they’re 85% male, so we kind of balance each other out!” Six schools make up the Colleges of the Fenway (The Fens is the name of the park is directly across the street, so the Fenway is the area around the park). Simmons sits just about in the middle of the group, and their Residential Quad is a block from Main Campus (actually right across from Emmanuel). The dining hall and health center (“which is incredible,” said the tour guide) are both in the Res Quad. Housing is guaranteed for all 4 years; freshmen are required to live on campus. There are college-owned apartments about a 7-10 minute walk from campus but are considered “on campus” and have RAs there. The tour guide loved living there: “It’s a comfort and independence thing.” For students wanting to move off campus, it’s easy to find off-campus housing through Facebook etc. This college lives up to its commitment to diversity, and students themselves are invested in it. “People have really great perspectives,” said one student. Seventeen Magazine named Simmons in their Top 20 Gay-friendly Schools list, and this was one of the first to have a defined admission policy for transgender students: if you were born OR identify as female, you can apply. “People here are really respectful of pronouns.” There’s also good religious diversity and “people are from everywhere.” There were students wearing hijab and necklaces with Arabic writing. Both Kosher and Halal meals are served on campus. Entry to their 3+3 Direct Entry/Accelerated PT (Exercise Science-PT) program is based on GPA, coursework, and SAT/ACT scores. Students keep financial aid through the 4th year since they technically don’t finish the BS until then. However, their merit aid stays with them for the last 2 years and they can file the FAFSA for graduate work. They’re known for their Information (Library) Science programs (and the library itself is amazing: “Lots of COF students come here to study.”) Students can complete a major in Information Technology, or complete a 3+1 program Information Technology (BS) + Library and Information Science (MS) or Computer Science (BS) and Library and Information Science (MS). Students can complete a 4+1 combining Biology, Nutrition, or Exercise Science (BS) with Nutritional and Health Promotion (MS) or can earn a BS in Nutrition and Food or Nutrition and Dietetics. Students interested in Public Policy can complete a 3+1 program in Economics (BA) + Public Policy (MPP) or Sociology (BA) + Public Policy (MPP). Unusual Minors or Concentrations include: Gender History, Scientific Computation, Radio, Health Care Management, Public History, Physics of Materials, and Principled Leadership. WIT, unfortunately, often gets overlooked when students are looking for the type of education it offers. This is a hidden gem that offers intensive hands-on education and excellent job preparation. This, combined with its location (the Fenway area of Boston) and its membership in the Colleges of the Fenway consortium, provides a plethora of opportunities not available at many other places. Surprisingly, they DO have a College of Arts and Sciences which houses its Applied Math, Sciences, Management, and Humanities/Social Sciences departments. The College of Engineering and Technology houses all the Engineering as well as Computer Science. Engineering majors take an Intro to Engineering class to help figure out (or to confirm) which area to focus on. They offer a BSE in Interdisciplinary Engineering. In addition to fairly typical engineering degrees, students can also choose Electromechanical, Biological, or Biomedical. There’s new construction to expand space for the for the Biomedical department. The College of Computer Science and Networking is housed in this college. IBM donated several servers, and the students in Computer Networking have to hack into the network for class. The College of Architecture, Design, and Construction Management offers 4 degrees in Industrial Design, Interior Design, Architecture and Construction Management. Wentworth is one of a handful of universities nationally that offer Co-op placements for their students (keeping company with places like Northeastern, Drexel, and Cincinnati). Co-ops last at least 12 weeks with students working at least 32 hours per week. These can be completed anywhere, but the earliest a student can register for a co-op is the summer sophomore year, a little later than some other schools. Students didn’t seem to mind this, but it does limit the opportunities to explore areas and quickly “reset” the track they’re on if they discover that their major might not be exactly what they want. Students are advised to complete 2 co-ops at different locations, and they tend to get really creative and work at great places. For example, one student majoring in Applied Math did her co-op in Data Analytics at a biomed company. WIT’s graduates have a 98% grad placement rate, and the Brookings Institution has ranked them in the top 7 for occupational earnings power with a perfect score of 100, putting them in good company with schools like Harvey Mudd, NJIT, and CalTech! This is far from the only high ranking they’ve earned for job placement and earnings. A large majority of students come from Massachusetts, so there are a decent number of commuters. Students not living at home must live on campus for the first two years, and housing is guaranteed for all 4. Just over 75% of first year students live in the dorms with about half of all students living on campus. There are a lot of suites and some single rooms available. The student health center is shared with MassArt and MCPHS and is located on the 2nd floor of one of the new MassArt dorms next door to WIT. Parking is not readily available because of the urban environment, but public transportation, including T stops, are immediately off campus, and there is a lot within walking distance. Because of the location in Boston, there are plenty of things for students to do at a reduced (or no) cost, including free tickets to the MFA and Isabella Stewart Gardner museum. Mass Art (as it’s commonly referred to) is the only art school and the only public school in the Colleges of the Fenway Consortium. In fact, it’s the only public art school in the country. The first year of study is the Studio Foundations year. Most classes are capped at 25, but for Art History (taken both semesters), everyone piles into the auditorium. One of the tour guide’s favorite classes was the 4D/time class in 2nd semester of freshman year. Students are expected to complete 9 liberal arts classes in addition to their major. Two of these are required in the freshman year: Freshman Year Seminar and Thinking, Making, Writing: Using Words with Clarity and Flair. After that, they have more flexibility in fulfilling the remaining 7 classes. There are 9 student galleries in addition to several other display areas. Students are taught early how to present their art and are expected to do so regularly. Twice a year (usually December and May), students have the opportunity to sell their work in week-long sales open to the public. Students receive 60% of the selling price with the remainder going to the college to fund student events and other programs. They also do a lot of outreach with the community, including a program called Spark the Art. They’re also a member of the ProArts Consortium that brings together both performing and visual arts institutions in Boston. They offer all the typical majors you’d expect from an art school and have some amazing, more unusual programs such as Glass, Animation, Industrial Design, Architectural Design (also offering an M.Arch. ), Art Education, Fibers, Fashion Design, and Studio for Interrelated Media. However, I was highly disappointed in the info session. It could not have been more canned. They had a student there to help with the presentation which initially I was pleased to see, but it was so rehearsed and “game-showy” that it was hard to take them seriously. They said all the right things – accessibility to professors (“They’re more than happy to talk to you and they really want to know you!”), research opportunities, “You’re using a text book that the prof wrote,” … but it sounded like they were jumping through hoops and trying to check off the things families wanted to hear rather than being authentic and giving a sense of what it was really like to be a student on campus. BU is a large private research institution; UROP dedicates $1million in funding for undergrad research. “Everyone is passionate and empower each other to do bigger and better things,” said the student in the info session. “They’re similar in that they’re bright, ambitious, driven. It opened my eyes that I’m not the smartest kid in the room.” As a major university, it’s no surprise that there are a myriad of academic colleges to choose from, and students can double major or complete a Dual Degree in which they earn 2 bachelors in 4 years (and attend 2 graduations). Housing is guaranteed all 4 years. 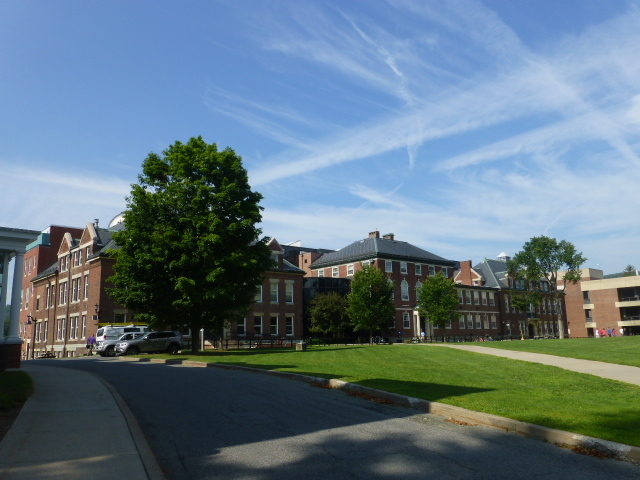 Freshmen are often housed in large towers of traditional-style dorms. There are lots of brownstones with 20-30 students, mostly upperclassmen. All dining halls, kosher included, offer vegan meals. There’s no shortage of things to do with 450 clubs on campus (including a Beekeeping society!). A favorite campus tradition (according the tour guide) was Lobster Night: students get a ticket for a lobster with every meal swipe. The Beanpot Hockey Competition is a huge yearly event when the team takes on BC, Harvard, and Northeastern. NE and BC are the 2 big rivals. Bubble Soccer (in hamster balls) bring out lots of people as does the annual Pumpkin Drop run by the Physics Department. Students fill pumpkins with paint, dry ice, flour, and more, then shove them off a plank on the top of a 10-story building. Study abroad is an integral part of the university, and they have programs for all majors to study abroad. One of the Earth Science professors is a leading expert on the oldest ice on earth and takes people with him to Antarctica. There’s a freezer on campus with the oldest ice in the world! There are also Internships abroad, many of which offer courses for 3-5 weeks before students are sent out to work. The Global Medic Brigades is a club. Students can go work with that. “It was amazing and humbling” The Hospitality majors must complete 2 internships, 1 of which must be abroad. Within the College of Liberal Arts and Sciences, they offer an option to join The Core, an integrated course that crosses disciplines by looking at the world’s great works of thinking and writing. It is designed so students take 2 classes per semester for the first two years, looking at humanities, social sciences, and natural sciences. These classes fulfill several of the required distribution requirements, and those choosing to complete the entire sequence will have notations on their transcripts. To be considered for their Presidential Scholarship, students must apply before 12/1, but no additional paperwork. About 1/3 of their class is admitted under the Early Decision round. The average unweighted GPA coming in last year was a 3.8. This Jesuit college sits in Chestnut Hill on the outskirts of Boston; the last stop of the T’s red line gets students easily in and out of the city (it’s about a 25 minute ride to downtown). The tour guide said that he “didn’t come here because it’s Jesuit. I’m not even Catholic, but I’ve come to appreciate the culture and values here.” This is a highly residential and involved campus. Almost all freshmen (~99%) and 85% of students overall live on campus. Housing is so good that seniors tend to move BACK to campus if they moved off in junior year. Food is also great, according to the tour guide. They have a pastry chef who used to work at the Four Seasons, and the dining hall makes a New York Times rated steak sandwich! This campus falls on the “smaller size of Tier 1 Research Institutions” but it’s still a liberal arts institution at heart. “We’re trained to think in different ways,” said one of the students. There are 15 core requirements but with at least 30 choices within each one. Complex Problems is a 6-credit core co-taught classes: topics include Race, Gender, and Violence and Global Implications of Climate Change. Students are ask to grapple with critical questions of global significance, looking at where they fit into those issues and what steps they may be able to take to address them. Enduring Questions classes are similar, but are paired, thematically linked 3-credit classes such as Epidemic and Disease. This used to be a small program; now they save 1000 seats for First Year students. Students must take 2 theology courses as part of their core requirements There are plenty of options including Person and Social Responsibility Perspectives on Western Civilization. Students can enroll in the Pulse Program to fulfill this. Classes has15-20 students who do service-learning work in Boston in their choice from one of 15 or so placements. These range from GED tutoring at a Correctional Facility to suicide prevention to working in a nursing home. They connect to social justice issues and to life outside the university. The nursing school is well regarded and trains students well. They complete 7 clinicals at some of the best hospitals. Business Analytics, Managing for Social Impact and the Public Good, and Entrepreneurship are offered as co-concentrations only! They offer a concentration in Corporate Reporting and Analysis. They have a 95% acceptance rate into med school. There are 2 traditions that bring all members of a class together: at Convocation (during orientation), students come together for the Common Read (the 2017-18 book is A Backpack, a Bear, and Eight Crates of Vodka). Students group together by Res Hall with banners and march down to the hockey arena where they hear the Common Read author speak. To book-end things, students come together again at commencement: they stay up all night and watch the sun rise from the top of the parking garage. After changing to cap and gown, they march together through the rotunda to graduation. There is a lot of school spirit when it comes to athletics, and the teams don’t disappoint. The yearly “Holy War” football rivalry against Notre Dame draws a huge crowd. Hockey is particularly huge here: “It gets cold and dark here in the winter. What else are you going to do?” said the tour guide. They also play in the Hockey Round Robin with Northeastern, BU, and Harvard. Last year they lost in overtime to Harvard. This is one of the few information sessions I’ve attended where the presenter gave more than just lip-service to the concept of fit. For example, she asked if classes of 13 seemed too big (no one) or too small (1 student) – and then told him that this might not be the right place for him. Williams provides a great deal of opportunity for students to pursue what they’re curious about. Students must take 3 classes in each of 3 divisions but what they take is up within those areas is up to them. Majors are mostly fairly straightforward, but Concentrations (minors) are more interdisciplinary such as Justice and Law, Cognitive Science, and Public Health. This is one of a few places that offers Oxford-like Tutorials: students are initially placed in groups of 10 then split into pairs. Students alternate between writing a 5-7 page paper (sent to the professor and partner 24 hours in advance) and responding to the peer’s paper (with a 24 hour turnaround). At Tutorial, they discuss it, usually with the professor simply observing. Students get really good at developing and defending a point of view. Half the students take at least 1 Tutorial (which are offered in all subject areas); most will take more than one. 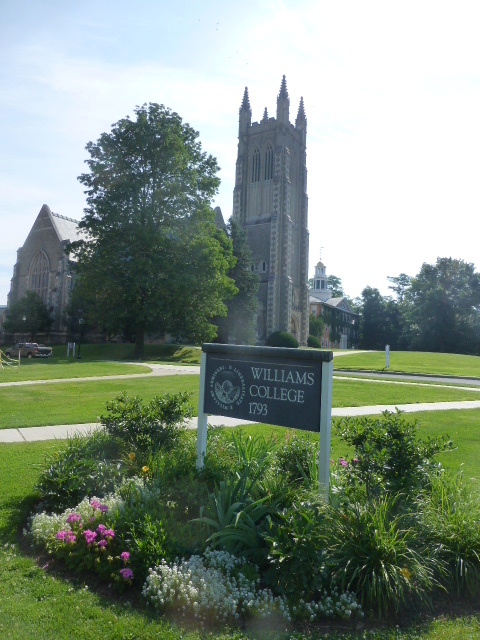 Williams operates on a 4-1-4 schedule: 4 classes in fall and spring and 1 class in January (yes, it’s required every year). All freshmen stay on campus; after that, students can stay, do an internship, or study-away. Class offerings range from academic to experiential; all are Pass/Fail to encourage students to try something new or focus on a passion. Mystic Seaport, CT focusing on oceanography. Part of the experience includes 10 days at sea on a tall ship. South Africa: students study at the University of Cape Town and complete an internship. Intro science lectures can have up to 100 students (but smaller labs). One student’s largest class was “Chemistry of AIDS” with 75. Another student’s biggest class had 30 (Intro to Econ) and smallest was 7 (an English Seminar). APs can’t replace credits (ie, they must still earn a certain number of credits at Williams), but the scores can place students into a higher level and out of some of the biggest classes. Most research funding (including Room and Board during the summer) goes to science and math but students can research anywhere. Our tour guide did research on Bilateral Relations with Russia and China. One math professor is a leading researcher on knots of all things. He took on 14 students to research knots. About 40% of those doing research will co-author a paper by graduation. If small-town New England starts feeling too isolated, students can hop on a regional bus that stops on campus and head to Albany or Boston. The school runs shuttles to Albany and Grand Central (which may be subsidized for students on financial aid) at breaks. There is lots of schools spirit here. About 1/3 of students play varsity sports, and stands fill up at games. 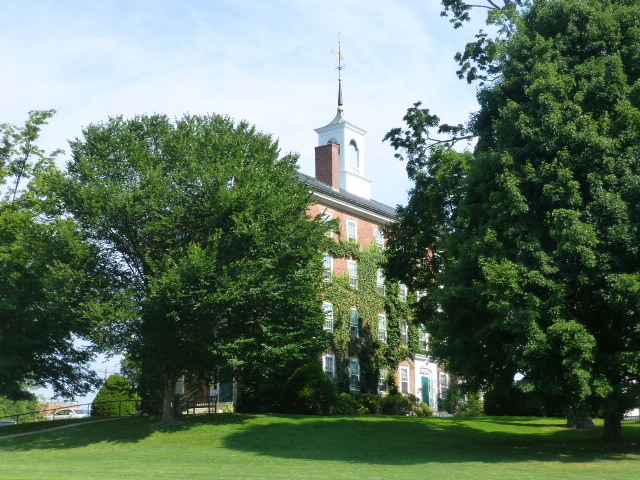 Amherst is their big rival and has been since 1820 when Williams’ president took half of everything – faculty, library books, the money – and started Amherst. Several years ago, Amherst pulled a prank on Williams by carving an A into one of their fields. Williams retaliated by carving a B+ on theirs. Most students (85%) live on campus. Up to 125 seniors can move off campus, but they didn’t have that many petition to do so this year. Entry Program groups together 25ish first-year students and 2 Junior Advisors to give them a “home base” and a family-feel to what is otherwise a fairly typical dorm situation. For example, they’ll do Entry Snacks on Sunday night for a “catch-up.” It is unique that they freshmen have 2 JAs grouped with them – but the tour guide bragged incessantly about how Williams mixes dorm-mates so they get to meet a variety of people – without realizing that many other places do this, too! The main dining hall in the student center can get busy; at peak rush, “the wait can be 10 or 15 minutes, but there are other places to eat if you’re in a hurry.” Sunday “Kids Night” dinner (mac and cheese, chicken fingers, etc.) gets rave reviews, but the food is good overall. “This place has the best chicken tikka masala I’ve ever had,” said the tour guide. The Outdoor Club is one of the biggest clubs; a $10 fee gets students access to everything they offer. Mountain Day (a surprise day-off from classes with picnics, hiking, etc) is a huge deal like at many other colleges. There’s also a day in the winter when classes are canceled for a day of skiing, sledding, and more, but students know about that in advance. Admissions is highly selective, but they do accept about 40% of ED applicants “because it’s self-selecting and they often have a previous relationship with the college.” Applicants need 2 subject tests on addition to the SAT or ACT. “Don’t take both math tests, but other than that, choose whatever you want.” The Optional Supplement “really is optional. Use it if you feel like there’s something you need to add to the application.” Admissions is need-blind, and students need to submit both the FAFSA and CSS Profile. They do not offer merit scholarships; average debt at graduation is $13,000.